Free program for video quality measurements. Supports different input formats (Windows AVI (*.avi), AVS, YUV, BMP) and metrics (PSNR, Delta, VQM, SSIM, MSU Blurring / Blocking Measure). Main features: results are saved in CSV (can be opened everywhere), all metrics are visualized, comparative analysis (comparison of three files: original, and two other, for example processed by different codecs). Version 10.1 is a freeware program which does not have restrictions and it's free so it doesn't cost anything. 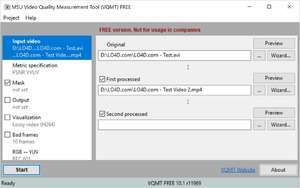 For security reasons, you should also check out the MSU Video Quality Measurement Tool download at LO4D.com which includes virus and malware tests. Additional screenshots of this application download may be available, too. MSU Video Quality Measurement Tool download been highly rated by our users.